Some folks are nervous about buying wilderness instructional videos as they have purchased inferior videos from other "producers" in the past or have heard stories of folks being snookered into buying snoozer and rip-off videos. We understand that concern. At Hoods Woods we have a library of material produced by others and there is a lot of junk out there. As an example, we watched one guy say he was going to show how to pluck a chicken. He struggles with the feathers for a few minutes and then he just gives up and skins the bird. The video was shot in a dank cellar with a poor camera and on-camera "Buzzy" audio. In another video a guy explains the Figure four deadfall trap in three sentences ....from the back of a pickup truck while cars zoom past. To be honest some of these people are skilled woods folk but they are not teachers nor are they videographers. Not us. We didn't earn Our collection of Telly awards by being amateurs. With decades of teaching experience in accredited Universities, years of video and film production experience, Top quality Non linear Editing bays, High quality triple CCD Broadcast Quality digital video cameras with digital wireless microphones and the best duplication available, no one can hold a candle to our product. Each of our videos is carefully planned with just enough humor, extreme close-ups, and special effects to make watching a pleasure instead of an effort. You'll see, put on one of our videos and soon the entire family will be sitting around, fascinated by the skills we have to share. To help support your video learning's we have an entire forum of dedicated fans and wilderness folk with whom you can trade thoughts, ideas and skills.... Free. Some of the participants are leaders in wilderness instruction and along with the Hoods, are there to answer questions and to help you to learn even more. Talk about full service instruction! There is no other company that offers our level of support. If you are concerned about image quality... please don't be. Visit our different video pages and look at the photos. Those are actual "Frame grabs" from the videos and are at a much lower resolution than the actual video you will receive. Finally there is the pricing. Many of the other wilderness instructional videos cost $29.95 and some are even $49 - $69 EACH. Our DVD’s are only $19.95 each and many are almost TWO hours long... and jam packed with time tested skills, information and adventure. There is no better deal. Wilderness instruction is our life's work and video production is our tool. Please, take a chance. We know you'll be pleased. Books are portable and familiar but there is another, much better, way to learn survival skills. You can learn the ancient way! Watch the techniques as you hear the instructions. Since ancient times Humans have learned skills by watching them being performed as the steps are explained. As a species we did fine this way for a million years. Even animals can learn by WATCHING. When the printing press was invented it was not intended to replace the old ways of learning. Books are justnot efficient ways to learn SKILLS or TECHNIQUES. Arguably, the invention of Video was as earthshaking as the invention of the printing press. Suddenly we are able to provide instruction in the way humans are intended to learn, Vision and Sound.... remember the old saying..."Watch and Learn"? Not only is video a better medium for wilderness training but a lot of the books out there are just tired rewrites of the same old stuff found in military manuals. Books require that you read, comprehend and then somehow imagine how the skills can be executed in the wilds. Remember, even military manuals were only intended to SUPPLEMENT Visual and audio instruction. Video goes in your ears and eyes and you KNOW how to perform the skills. The brain just catalogs what it sees and incorporates the information. Remember "Everything you see and hear is stored in the brain". We all know that there is no way that everything we READ is stored in the brain. One of the things that tickles us is how some of our customers have become "Experts" because of the videos. One guy watched our set and came out with two books about survival! Others have taken the skills and written articles about topics they learned in the videos. We love it. Any good teacher WANTS the student to excel and in turn, become the teacher. That is why so many schools and teachers use our videos in outdoor classes. The Woodsmaster© Video Series are designed to make you the Woodsmaster! This series presents the special skills that can make your time in the wilderness more enjoyable, safer and make you far more confident. The videos are hosted by Ron Hood who will show you many interesting and important wilderness living and survival skills. The presentation of these skills is enhanced with clear explanation, great photography and many of the special "little tricks" that few but the most experienced Woodsmasters will ever know. Woodsmaster Home - Cave Cooking! To see Karen Hood's Cave Cooking videos! So what the heck is Cave Cooking? Cave Cooking is our way of teaching you about primitive cooking and food preparation tricks and techniques as well as other special skills. This is the series that makes wilderness living and self-sufficiency fun. It can also help you gain a few pounds when you see how Karen cooks in her Dutch Oven. This series was developed to give a quick overview of volumes 1-5 of the Woodsmaster series and volume one of Cave Cooking. 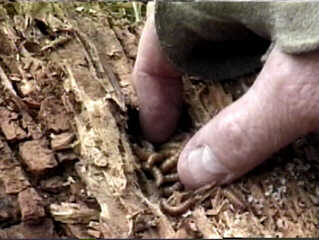 It contains footage seen in the regular Woodsmaster videos. If you want an overview of our series, this will help. We do think that your best bet is to just start with the regular Woodsmaster and Cave Cooking videos however. We have some great gift ideas for friends and family!